Always up for a literary adventure, Delaney Nichols left Kansas to pursue her dream job at the Cracked Spine, a Scottish bookshop specializing in rare manuscripts and other valuable historical objects. So when her boss asks her to retrieve a hard-to-find edition of an Oor Wullie comic, Delaney is only too eager to please. 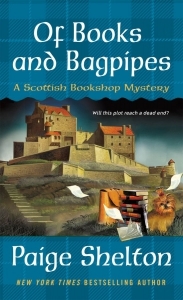 Even though her trip to Castle Doune, outside of Edinburgh, ends up being a lot more than she bargained for. . . While viewing the Highlands from the castle’s ramparts, Delaney spots a sandal-clad foot at the other end of the roof—one that belongs to the now-deceased man in charge of bringing her the Oor Wullie. Delaney grabs the pages of the comic book and hides them under her jacket before rushing off to find the police. It’s not until she’s back in at the Cracked Spine that Delaney realizes just how complicated this story really is. Can she untangle the plot and figure out who the killer is. . .before getting herself booked for murder?